This is a versatile and elegant wall shelf that measures 10-3/4″ wide by 5-1/4″ deep by 9″ height, and handcrafted by Michel, a Canadian craftsman. The wall organizer shows off a low-profile and sleek design and it’s made of reclaimed wood for durability and natural feeling, meanwhile, multiple wood finish choices ensure it blends well with the interior decoration of your room. 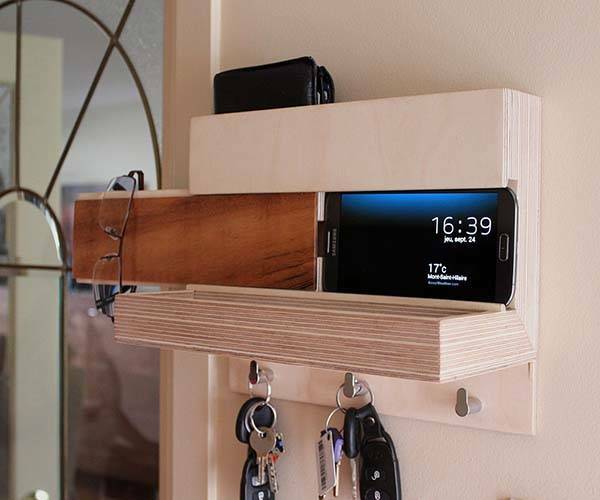 The wooden wall organizer has a custom docking station that can keep your smartphone up to 3-1/8″ wide and over 1/2″ thick in landscape mode, and a slidable door keeps your umbrella or sunglasses in place. 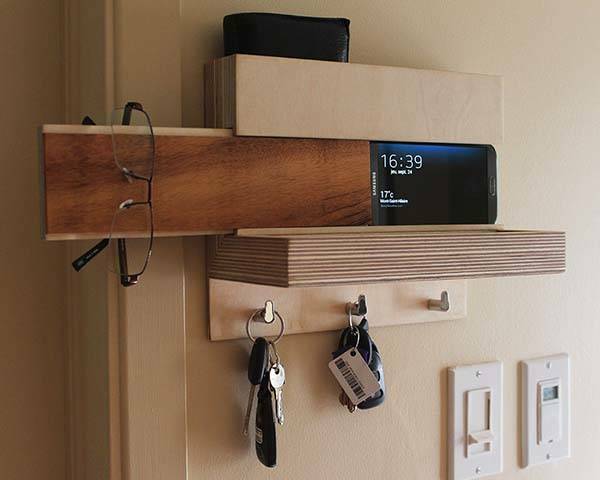 Moreover, two individual top and central trays can be used to store your wallet, gloves and other items, and using three integrated metal hooks, the wall shelf holds your keys, folding umbrellas and more. In addition, easy storage point allows you to access your stuff with ease. The handmade wall organizer is priced at $121.14 USD. If you’re interested, jump to Etsy for its more details. BTW, also don’t miss the handmade wall shelf and more related cool stuff by following tags.